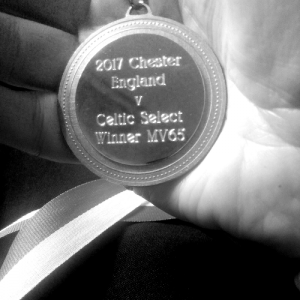 Exactly a year ago, I fulfilled a lifelong ambition – to represent my country at sport. 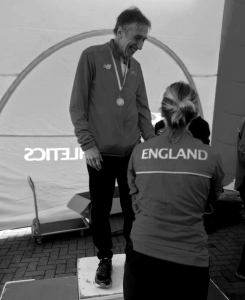 I was selected to run for the England over-65s in an age-group marathon. A week later my running career came creaking to a halt. 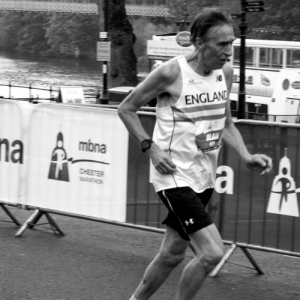 I was in the best shape of my life for the Chester marathon. OK, maybe I was a little faster as a schoolboy runner 50 years ago. But nobody ran marathons back then. And I certainly hadn’t felt as strong as this in my blobby 20s, 30s, 40s, 50s. When I took up running again – just 3 years earlier, I couldn’t jog, let alone run, 100 yards. But once I’d shed around 50lbs of flab, and tried a couple of parkruns, I found I was surprisingly good at it. I got serious about training, started competing at distances from a mile to a marathon, and steadily started climbing the UK ranking lists. In the 65-70 age-group category, I’d made it into the top 10. 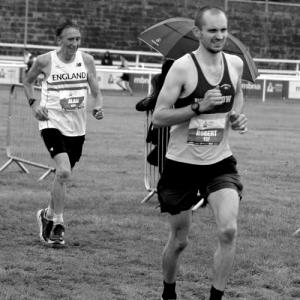 If you look at the race photos as I’m nearing the finish line at Chester, that’s not unbridled joy on my face. It’s concentration, determination, utter weariness. But above all, satisfaction – not so much at beating my age-category competitors, but because on that memorable day, I’d been the best I could be. But the following weekend, foolishly ignoring the advice that my body needed time to recover, I ran another half-marathon. It turned out I wasn’t Superman. I stumbled to the finish in a decent time, but hurting. The runners’ dread – a torn achilles. Ever since – for a whole year now – it takes both heels several days to recover even if I just jog a mile or so. Racing’s out of the question. I miss so much about running. I miss the camaraderie and the friendly rivalry. It’s a funny thing about runners. We meet up almost every week at various events, and we chat. I’d know someone’s personal best and their target time and the details of their latest niggle – but not a thing about who they really were and what they did for a living. There was no hierarchy, no class, no status. 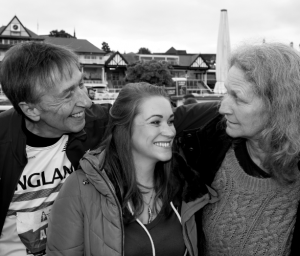 All the talk was about our own personal adventures and aspirations – as runners. We scrapped fiercely in a race, and hugged exhausted at the end, each proud of the other’s effort. It was noble. I miss the age-group categories. With most other sports you come to a point where you can no longer compete, so you hang up your boots. Instead of participating, you watch. You’re too old. With running you’re never too old. OK, you’re not going to compete with Mo (I tried in a half marathon and failed – by 30 minutes!) But in your age-group you can still compete – even if it’s just with yourself. There’s a WAVA rating where you can take the distance you’ve run, your time and your age, to see whether your performance – probably slightly slower this year – still ranks higher than it did last year. A ‘good for age’ time. I rather like being good for my age. I miss the training. The hard sessions, when you drive your body and your mental strength to the limit. But even more, the long leisurely sessions, where you’re just getting the miles in, running somewhere you’ve never been before, close to nature, along the canal, through the woods. Half-consciously, you’re assessing your performance today, and the way the body’s holding up. But deep in the sub-conscious there’s a mental reboot – you’re wiping the day clean, fresh and ready for the challenges to come. That’s what I miss most of all. When the rest of your day is focused on dementia care, and you see the person who was your partner for life slowly and inevitably slipping away from you, you need time to forget, time to recover, time to remind yourself that you can still control some parts of your life. I’ve stayed well clear of the running scene since my injury. Just watching leaves me itching to get started again – but I know this battered body still needs time to heal up properly. But many of my running buddies have stayed in touch. They’re sympathetic, wondering how I’ve filled the huge gap in my life. They don’t need to worry. The Care Combine has filled that gap – and then some. It’s true that sitting at the computer doesn’t give me the runners’ high, and I’m starting to avoid looking into mirrors when my stomach walks past. But the energy, determination and drive that running restored to me has carried straight over into my new project. Running proved that age was no barrier to starting again from scratch, and that success doesn’t need to take forever. And running taught me to target and work for the seemingly impossible, and then when I got there, to set my sights higher again. That’s exactly the same now as I seek to transform the way the whole nation handles dementia care. And, you know, while The Care Combine starts with dementia, that’s not where it ends. My plan is to get those diagnosed integrated back into society, involved in meaningful, purposeful activities. I want to give carers their own lives back, five days of the week free to go to work, or pursue their interests, or just to get a break. And since I want the service to be free, we’ll be heavily dependent on volunteer help. My vision is of a community supporting and helping one another just like the running community I love. Where nobody’s disqualified because they can’t keep up – if you’ve run as far as you can, it’s OK to walk. Where age isn’t a factor. Nor is gender, status, background. Where if you’re feeling sidelined or retired before your time, there are plenty of opportunities and new challenges. Where we can all be the best we can be. And on that note, I have to make my excuses and leave. It’s time to stretch those heels again. After all, it’s only six months till next year’s Manchester Marathon. Like it? Then why not share? Sometimes dementia can land you in big trouble - like in 'Where To Draw The Line'.